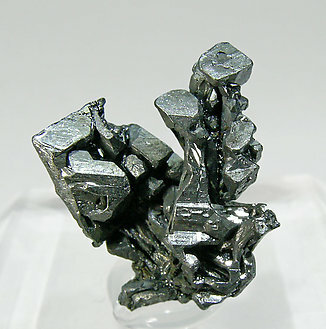 Arborescent growths, on matrix, of very sharp and bright octahedral crystals that form acute parallel alignments. 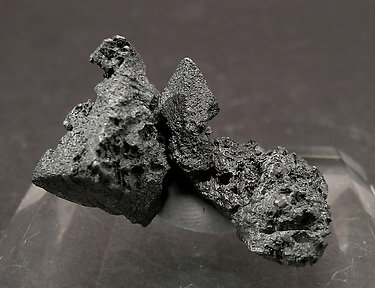 A very fine sample from the Imiter area. 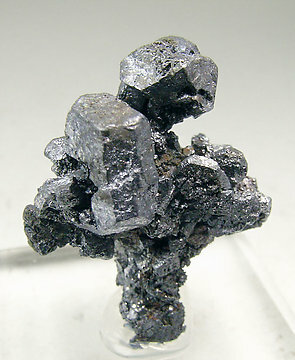 Aerial and very elongated cubo-octahedral crystal, with very well defined and bright faces and edges and window growths on some of the faces. 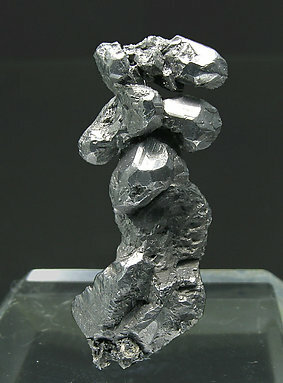 Good miniature with small crystals, which combine the cube and octahedron, and have well-defined faces and edges. Actually it is very difficult to obtain samples from this classic locality. Very aerial group of complex crystals, very rich with faces and considerably bright. Although on the label the only locality is Chile, we can presume, by its characteristics, it is from Copiapó area. The specimen is with a label from the now defunct company Suministros Escolares de Barcelona (SEC). We will send the label to the buyer. 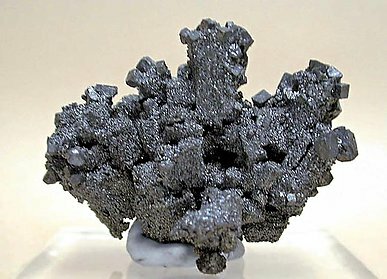 Very aerial growth of Acanthite crystals pseudomorphic after Argentite. They are cuboctahedral and have bright and very well defined faces and edges. An excellent miniature from a classic mine and formerly in the thumbnail collection of Thomas Moore, whose label we'll send to the buyer. 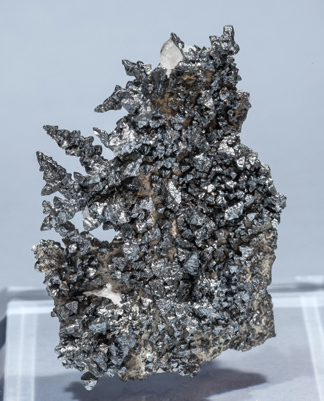 The crystals of this group are pseudo-octahedral and very aerial and they have an excellent definition and an especially esthetic disposition. 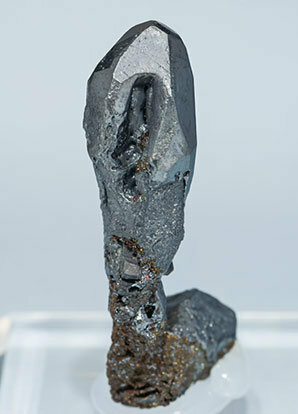 A perfect miniature with a fine sharp octahedral crystal whose faces and edges are very much defined as usual on the samples from the locality. 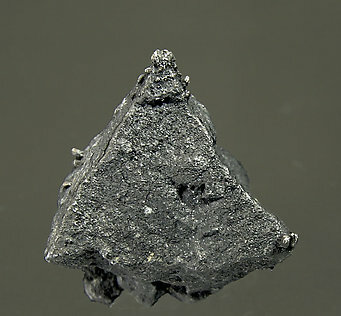 Well defined octahedron of Acanthite pseudomorph after Argentite, with two small Acanthite crystals in parallel growth. Good miniature. 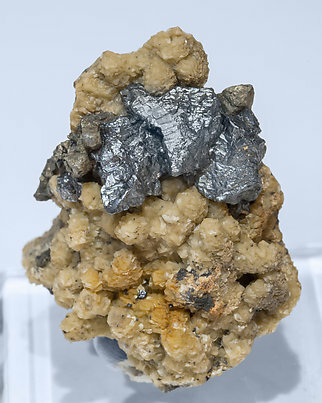 Group of two octahedral crystals, very well defined and of a considerable size for the species. 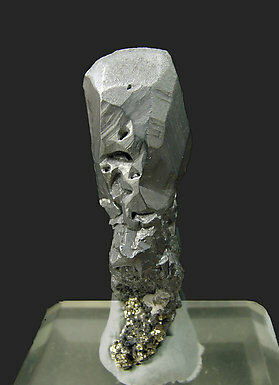 Unusual form: first elongated crystals and then pseudocubic sharp crystals. As in many other cases in this collection, different from the usual. Very aerial group of distorted crystals but they have perfectly defined faces and edges. 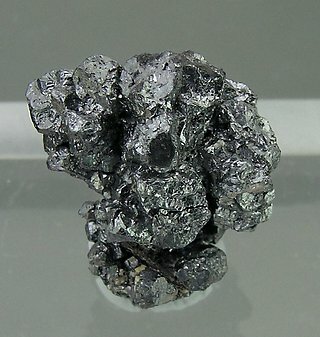 They have an excellent luster, a characteristic of the samples from this mine. Very aerial parallel growths of cubic crystals with perfectly defined faces and edges and partially skeletal. 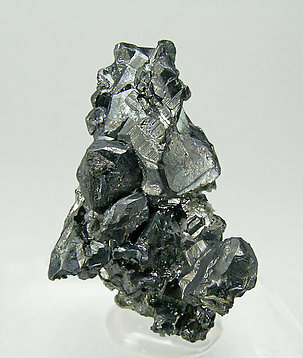 The Acanthite has an excellent luster, a characteristic of the samples from this mine. 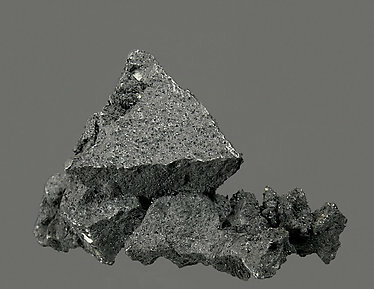 Very aerial group of Acanthite crystals after Pyrargyrite, with short-prismatic shape and coated by a last phase of Acanthite microcrystals. 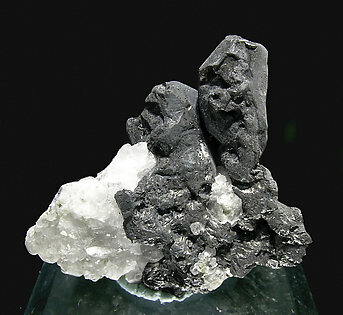 Aggregate of cubo-octahedral Acanthite crystals on Calcite matrix. Some of the crystals are very sharp while others are strongly flattened or show some dissolution on their surfaces. 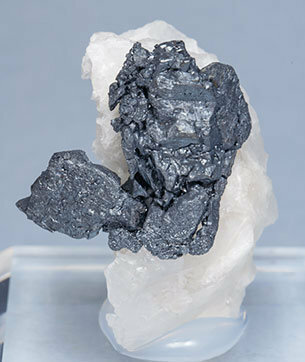 A magnificent sample, not only for the crystal size and its well defined forms. 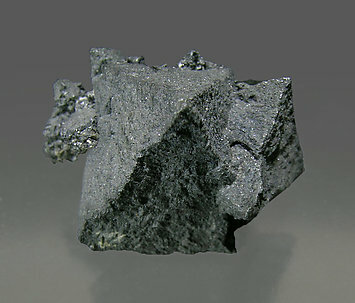 It is from a classic locality well known for Silver but where Acanthite was (and is) very uncommon. It is from Earl L. Calvert collection and we’ll send the label with the specimen, to the buyer. 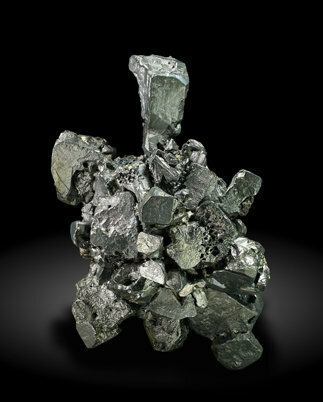 Aggregate of very sharp cubic Acanthite crystals that coexist with skeletal and hooked forms of the same mineral. 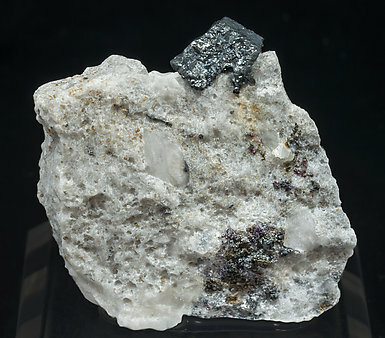 The aggregate, on a Calcite matrix, shows a magnificent contrast between the snowy white Calcite and the luster and relief of the very aerial Acanthite. 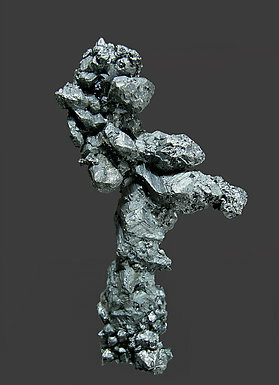 Centered and parallel growths of very aerial and elongated crystals. They have well defined faces and edges and hollow growths, with a matrix of Calcite crystals. 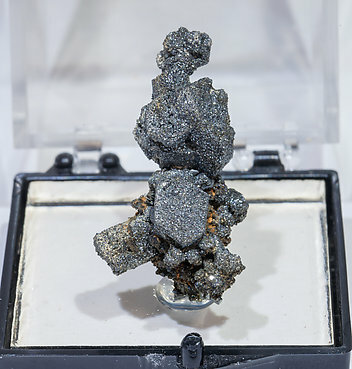 Great sample from the Silvane collection, with a wide pedigree reflected on several labels, one of them from the prestigious Bill and Carol Smith collection, which we’ll send to the buyer. A novelty at Tucson 2018. 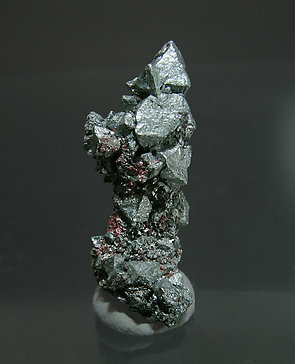 Very aerial growth of very sharp octahedral Acanthite crystals with epigenic Chalcopyrite and on matrix with Quartz. The sample has been analyzed and we’ll send a copy of its analysis to the buyer. 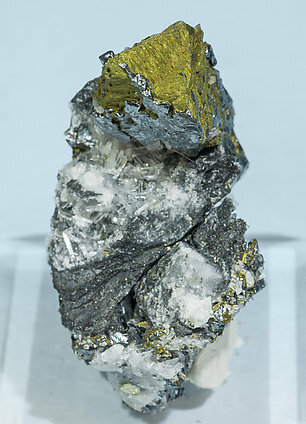 Very sharp and very bright Acanthite crystals that are implanted on a matrix coated by rhombohedral Dolomite crystals between yellow and pale brown in color. An excellent German classic that was in the Moutet collection, at Marseille. With the sample we will send to the buyer an old label from the prestigious Deyrolle dealers, Paris. 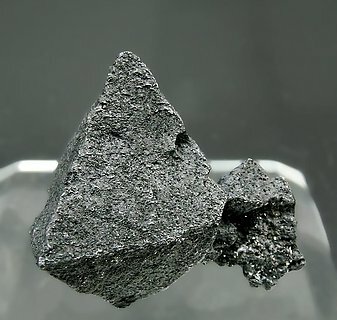 Isolated cubic crystal, something that is very uncommon with Acanthite, deformed but with very well defined faces and edges. 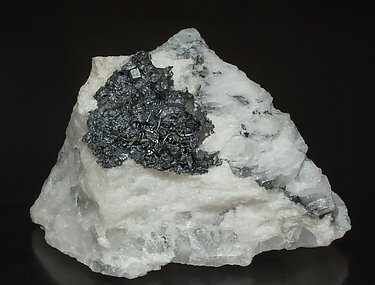 It is bright and on a Calcite and Quartz matrix with massive Proustite. 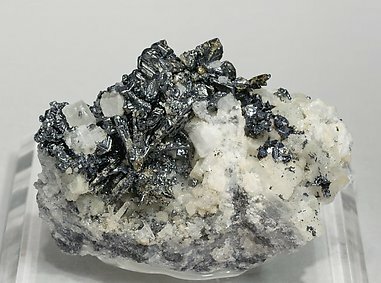 The sample is from a historic mine, very well known for Proustite crystals but where crystallized Acanthite is rare. We’ll send to the buyer the original label and also a copy of the computer card with the full collection catalog text.